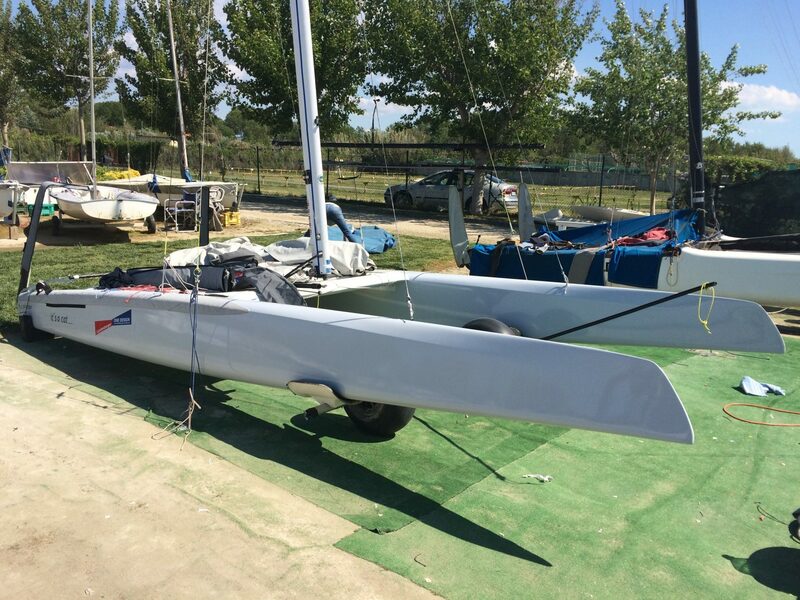 The daggerboards of this Exploder A class cat are Z10 type; the last evolution of z-shaped, they give more stability and allow to fly a little earlier. When on the beach we can put them in useful compartments. Cases are controlled with the blue sheet. Thanks to a closed-loop system below the trampoline we can control both daggerboards from any side of the boat. Once inserted in the cases, we secure them with the red rope and a cleat at the top of the daggerboard. When cases are all forward, we navigate in “no-fly mode” or “neutral”. The angle between the daggerboard and the hull is 90°; the boat has little lift but, more or less, it behaves like an A classic cat. While we push backwards the cases we entry in “fly mode”. With medium wind (10-12 knots) we can put them at the level of the second hole. All these settings may vary also from the weight of the helmsman. The faster the boat is, the lesser we need to push backwards the daggerboards. We never push them beyond the third hole (2-3 cm) if we want to fly efficiently. The fact that we are flying doesn’t mean that we are fast. Moreover, with the aid of little iron nails, we preset the lift that we want to have before going out.